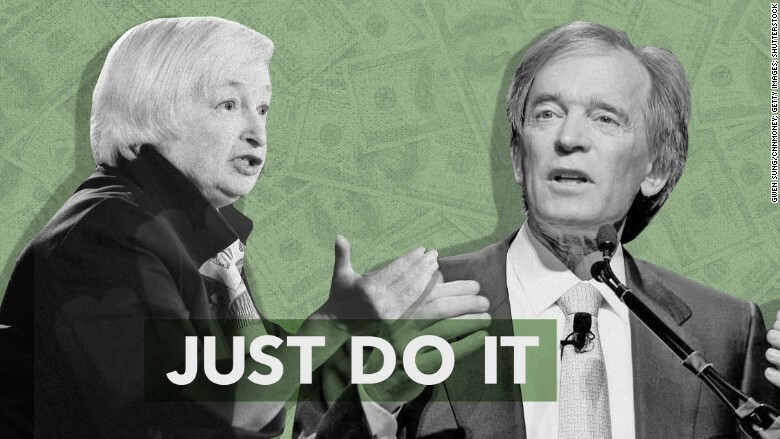 Bill Gross wants America's central bank to do a rate hike. Now. Gross, the bond fund manager for Janus Capital, is very disappointed that the Federal Reserve didn't raise its key interest rate last week. Instead the Fed kept the rate at about zero -- where it has been since December 2008. "Get off zero now!" Gross wrote in his monthly investment letter. He says he has no doubt that it would cause "Near term pain? Yes. Long term gain? Almost certainly." Gross' opinion still holds significant weight. He co-founded Pimco, one of the largest and influential bond funds in the world. At its height, Gross managed Pimco's signature fund that held assets of almost $300 billion. Today, Gross manages about $1.4 billion in Janus' global unconstrained bond fund. But his opinion is still widely respected and often referred to as a "bond king." The Fed didn't raise its key interest rate last week citing concerns about the global economy and volatile stock markets. But several Fed officials say a rate hike will happen sometime this year. The Fed has two more meetings this year where it can make a decision -- one in October, the other in December. Still, some experts like Gross and even some Fed officials believed the central bank should have raised rates last week. Gross argues that a 0% interest rate hurts pension funds, takes away incentives to save and eventually suppresses economic growth. The Fed lowered rates to zero at the height of the financial crisis in 2008. It was an emergency action to rejuvenate the economy and the collapsed housing market. Now with a much better economy, some on Main Street and Wall Street are fed up with the Fed's inaction. Gross, who is known for his colorful quotes, said ordinary Americans with 401(k)s are behind hurt by the low-interest rate environment. "They are on a revolving spit, being slowly cooked alive while central bankers focus on their Taylor models and fight non-existent inflation," Gross wrote, referring to an economic model that sways monetary policy. Gross grabbed headlines a year ago when he departed from Pimco. Since then, investors have taken money out of Pimco's key bond fund at a rapid pace. Gross stayed true to his character with an adamant piece of advice for the Fed. "Get off zero and get off quick," Gross wrote.